On November 15, 1965 Walt and Roy Disney, along with Florida Governor Haydon Burns, held a press conference to announce the construction of Disney World. 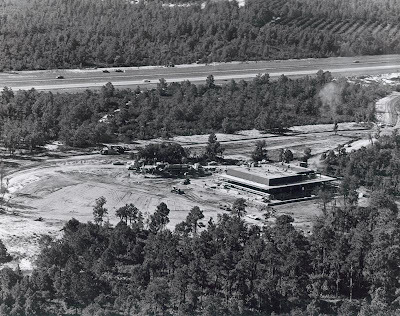 Walt Disney would pass away before the groundbreaking began took place on May 30, 1967, by which time Roy had renamed the project Walt Disney World in honor of the man who had dreamed the venture up. While it would take over four years before the Vacation Kingdom welcomed its first guests, the Walt Disney World Preview Center opened almost two years before the rest of the development. The Walt Disney World Preview Center began welcoming invited business and political guests on January 10, 1970 and opened to the general public on the 16th of the same month. 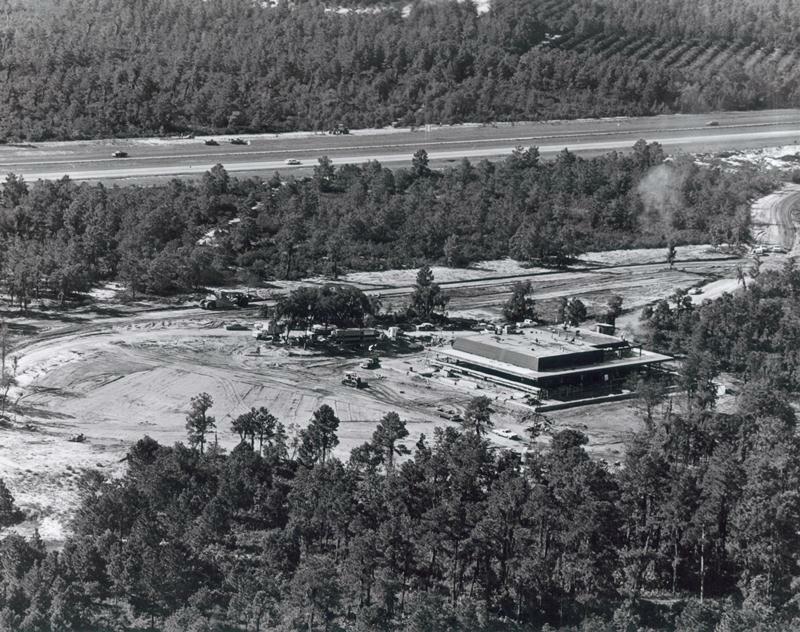 Seen here under construction, it was built just off of Interstate 4. Can you see it there in the background? That rinky-dink two-lanes each way road with precisely three cars on it? Yep, that was, and is, the main thoroughfare which cut through across the state of Florida. Once inside the facility, guests were greeted by a hand-selected group of fourteen hostesses, who were more than happy to answer any questions potential visitors had. From models and construction footage, to the 21 minute Project Florida film, the Walt Disney World Preview Center showcased what the first five years had in store for the swamplands of central Florida. In addition to just seeing what was coming, guest could go ahead and make reservations for the two resorts scheduled to open, the Contemporary and Polynesian Village, and pick up preview postcards and other souvenirs. The building still stands today, situated along Hotel Plaza Boulevard, but has not been utilized as a Preview Center in 1971. Still, as I have said many times, a preview center for what’s next at Walt Disney World would most certainly bring in the crowds of curious guests, just as it did in 1970. If I had my way, perhaps a preview center could bring new life to the Transportation and Ticket Center. That's an intriguing idea for the TTC.